Morris Edward Ashurst Jr., 75, died peacefully on February 5, 2019 surrounded by his loving family near his home on St Simons Island. Eddie was born April 1, 1943 at Fort McPherson, Atlanta, Georgia. The son of the late Morris and Louise Stanley Ashurst, Eddie spent his childhood in Eatonton , growing up with wonderful neighbors and friends. Eddie lettered in Football, Basketball and Track. He was an all round athlete and was offered a basketball scholarship to Piedmont College in Demorest. He was honored to be named to the Piedmont College Hall Of Fame and was on the Board of Trustees at the College for years. It was at Piedmont College that Eddie met the love of his life, Janice Wallace, . They celebrated their 53rd anniversary last month. After graduation he enlisted in the Navy and was sent to Officer Candidate school. He and Janice married while he was in Pensacola. He was then stationed in San Diego to serve on the USS Yorktown aircraft carrier. Eventually promoted to Lieutenant, he was deployed to Southeast Asia on the USS Yorktown and was an aircraft navigator. Eddie served for a year on the ship in Subic Bay during the Vietnam War. After the Navy, Eddie started his career with Safeco Insurance, living in Gaithersburg, MD, Nashville, TN and Birmingham , ALA, before moving In 1984 to Stone Mountain, Georgia. 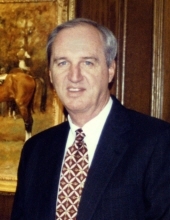 After working for Safeco for 17 years and winning numerous awards, he bought an Insurance Agency, Piedmont Insurance, based in Covington, Georgia. Janice and Eddie played tennis together, kayaked throughout the South, and enjoyed each other and life to the fullest. He and his family were active members of Smoke Rise Baptist church where he enjoyed his Sunday School Class. They lived in Stone Mountain until they moved in recent years to be close to their family. Although he lived in many places, he always said Eatonton, Georgia was home. He was a 6th generation Ashurst from Putnam County. More than twenty years ago, Eddie was diagnosis with early onset Parkinson’s Disease. The Emory Parkinson specialist told Eddie he would be in a wheelchair in five years. Ever tenacious, Eddie could still walk, more than 25 years later, and he never used a wheelchair. The love and care given to him by his wife, Janice Wallace Ashurst, a devoted wife and caregiver and his own extraordinary strength of personality gave him the determination to keep walking and living. Eddie is survived by Janice, and his two children, Morris Edward Ashurst, lll,( Stephanie) and Allison Ashurst ROSS ( Trae). Eddie was the wonderful Poppi to his Grandchildren, Reece Ashurst, Lawson Ashurst, Olivia Ashurst, Ellis Ross, Emme Ross and Evan Wallace Ross, his sister, Judy Ashurst Gilbert ( Bruce ), his nephew’s Lee Gilbert,( Aimee) Curt Gilbert (Ellyn ) and niece , Chris Hodges ( Foss) , and several great nieces and nephews . Janice’s sister, Elaine Hanson (Jerome) and her girls, Tracy and Nicole were devoted to Eddie .Eddie has a great many friends and the family would like to thank Buck Barber for his devotion throughout Eddie’s life and his battle with Parkinson’s . A graveside service will be held 2:00 p.m. at Pine Grove Cemetery, Eatonton with the Reverend Dr. Bill Kitchen officiating . A reception will be held after the service at The First Baptist Church Social Hall. To send flowers or a remembrance gift to the family of Morris Edward Ashurst JR, please visit our Tribute Store. "Email Address" would like to share the life celebration of Morris Edward Ashurst JR. Click on the "link" to go to share a favorite memory or leave a condolence message for the family.